JOHN HOCKENBERRY: Do you think this will ever be settled scientifically, if 97 percent consensus doesn’t settle it for you? Rep. JAMES SENSENBRENNER: Well, I — you know, I think that it’s up to the scientists and their supporters to convince the public that this is the right thing to do. And the supporters of that side of the argument in the Congress have been a huge flop. As Frontline correspondent John Hockenberry noted, there is a consensus amongst 97% of climate scientists that humans are driving global warming. In several of their many post-Frontline damage control efforts (more on these below), climate denialists invoked the most common response to the debunking of the ‘no consensus’ myth – that the 97% consensus figure comes from a small sample size of only 79 climate science experts in Doran and Zimmerman (2009). However, this is just one among many examples of the scientific consensus. For example, in the same study, Doran and Zimmerman received responses from 3,146 Earth Scientists; 82% agreed that human activity is a significant contributing factor to global warming. Note that the Earth Scientists contacted in their survey include petroleum geologists, who have a higher rate of consensus rejection due to the conflict of interest associated with their fossil fuel-dependent profession. Additionally, Oreskes (2004) surveyed 928 peer-reviewed climate science abstracts, finding that 75% either explicitly or implicitly endorsed the consensus view, while finding zero papers rejecting it in her sample. Benny Peiser set out to disprove Oreskes’ result and instead ended up confirming it. Using a dataset of 1,372 climate researchers and their publication and citation data, Anderegg et al. (2010) found a similar result to Doran and Zimmerman, that between 97% to 98% of climate experts support the consensus, and that the average number of publications by the ‘skeptics’ is around half the number by scientists convinced by the evidence of human-caused global warming. 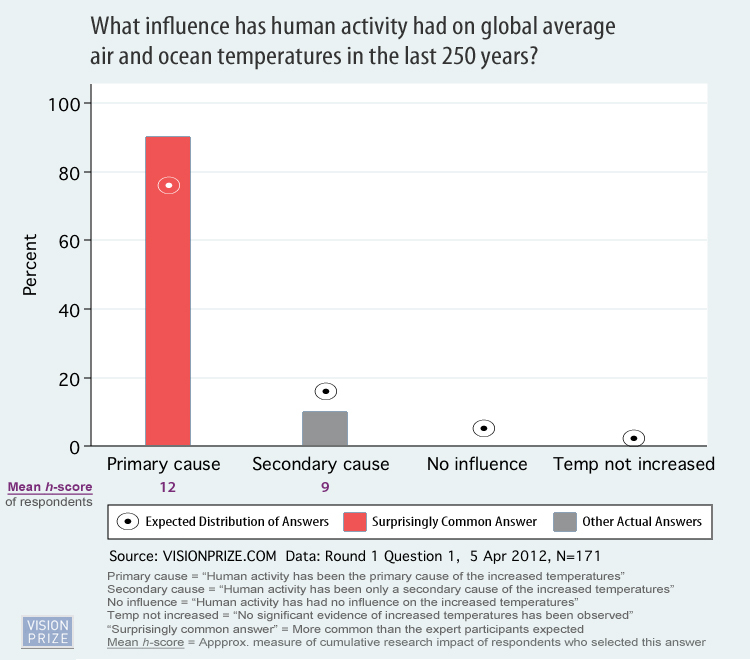 The Vision Prize also conducted an online survey of scientists in 2012, finding in a sample of 171 participants that approximately 90% believe human activity has had a primary influence on global warming over the past 250 years, with the other 10% describing the human influence as a secondary influence. The consensus was also significantly stronger than the participants expected. There is also a very long list of scientific organizations endorsing the consensus position, with none opposing it. The Academies of Science from 19 different countries all endorse the consensus. 13 countries have signed a joint statement endorsing the consensus position. A letter from 18 scientific organizations to US Congress endorses the consensus. And the consensus is also endorsed by a Joint statement by the Network of African Science Academies (NASAC). In short, the scientific consensus on human-caused global warming is an indisputable reality, supported by many different lines of evidence, despite the strategic efforts to deny it. However, the formula for climate action delayers is a simple one. As Rep. Sensenbrenner explained in the quote above, policymakers are only forced to take action to address climate change if the public demands it. Ding et al. (2011) found that when people understand that there is consensus among climate scientists, they are more likely to support climate policy. Lewandowsy et al. (2012) similarly conducted a study which revealed “that acceptance of AGW increases when consensus is highlighted.” The study also found that awareness of the scientific consensus can even offset ideological biases – “Consensus information also neutralizes the effect of worldview” (see this post for more details on this paper). Climate scientists are the most trusted source of global warming information among the American public, with 76% of Americans trusting climate scientists on the subject. The formula is therefore a simple one – convince the public there is no scientific consensus, they won’t demand climate policy, and policymakers can continue to delay serious climate action without political repercussions. The formula was articulated by Republican strategist Frank Luntz in an infamous 2002 memo. Thus far the formula has been successfully implemented. 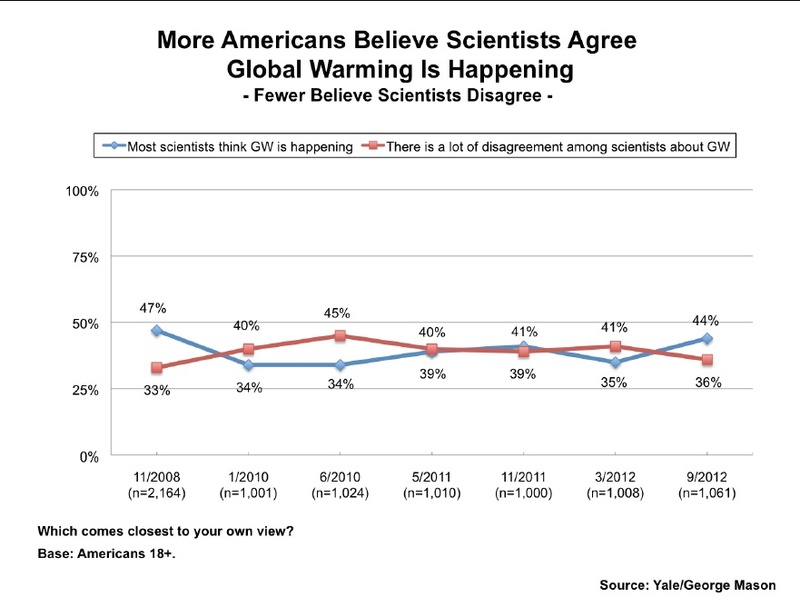 While the number of Americans aware of the scientific consensus grew in the latest Yale/George Mason survey, only 44% of Americans are aware that most scientists agree that global warming is happening. The number was as low as 34%, in 2010. The numbers are slightly better in the Gallup poll on the subject, with the latest iteration in March 2012 finding that 58% of the American public are aware of the scientific consensus, up from a low of 52% in 2010, but down from a peak of 65% in 2006-2008. Note that both of these polls are about the indisputable existence of global warming, regardless of its cause. More recently, Painter and Ashe (2012) found that between 2007 and 2010, 34% of American newspaper articles reflected “skeptic” views despite the fact that they only account for 3% of expert opinion. Overall coverage of climate in the media has declined in recent years as well, as documented in a Media Matters analysis. 2) Directly inflate public perception of climate ‘skepticism’ by creating lists of fake experts. We have seen many examples of these lists, for example in The Wall Street Journal and Fox News, but the most frequently-cited list of ‘skeptics’ which was also referenced by Fred Singer in Climate of Doubt (we’ll have much more on Fred Singer in an upcoming blog post) is the Oregon Petition. The trick behind the Oregon Petition is that anyone with a Bachelor of Science degree or higher can sign it, which allows climate denialists to both tout it as “a list of scientists” and also obtain a seemingly large number of signatories (over 31,000). However, this large-sounding number is easily put in perspective when we meet The Denominator. The 31,000 Oregon Petition signatories represent just a fraction of one percent of the total number of qualified Americans with university science degrees. But as long as this information remains unsaid, 31,000 sounds like a large number of scientists, seemingly disproving the consensus. There is of course also the fact that a person with a Bachelor’s degree in botany has no expertise in climate science, and thus giving the Oregon Petition credibility is like asking a dentist to perform heart surgery. Note also that in their post-Frontline damage control efforts, the climate denialists continued to repeat the ‘no consensus’ myth ad nauseam, including in three seperate blog posts on WattsUpWithThat alone – by the Heartland Institute, its director Joe Bast, and International Climate Science Coalition director Tom Harris. The consensus was even disputed by ‘skeptics’ in a live chat about the Frontline program, and in yet another weak Heartland effort from Jim Lakely. Clearly the climate denial movement views denying the consensus as a top priority. They may not understand climate science, but they certainly understand how to manipulate public opinion. Climate of Doubt showed that the climate denial movement knows they don’t need to win the scientific argument as long as they can convince the public that there is an ongoing scientific debate regarding climate change. They have been engaging in a strategic campaign over a long period of time to convince the American public that climate scientists are still debating the existence and cause of global warming. So far their deceptions have been successful. Only approximately half of the American public is aware of the scientific consensus on global warming, and addressing climate change is therefore not considered a high priority in the USA. Although a strong majority of Americans do support addressing the issue, policymakers can delay action without facing political consequences because the denial movement has successfully planted the seed of doubt in the public consciousness. The lesson climate realists should learn from this is that communicating the climate science consensus needs to be a top priority. For those climate experts giving media interviews, try and refer to the 97% consensus as frequently as possible. For the rest of us, communicate the existence of the consensus to your friends, family, on social media, in article and blog comments – everywhere you can. The lack of public awareness of the consensus is one of the biggest roadblocks to achieving serious climate policy, and as indicated by their post-Climate of Doubt damage control efforts, the denial movement knows it.